Our Recover technology seeks to provide a lasting solution that can reduce the appearance of wrinkles, without the use of painful procedures or unnatural chemicals. Our commitment to true results led us to an exciting scientific discovery: nano-technology. Our Recover Masque uses a patented, clinically-proved formula that delivers silica microstructures to wrinkles, which have been show to immediately reduce the appearance of fine lines and wrinkles. As the structures attach to your skin and each other, the net begins to shrink, straighten out, and lift, pulling the wrinkle up along with it. 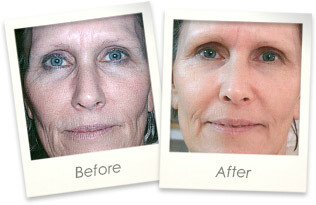 Click here to view the clinical research studies. While the short-term effects are pretty stunning, the long term effects are even more incredible. As the silica microstructure net lifts wrinkles, it also alleviates pressure on the face’s capillary network, allowing a healthy blood supply to once again flow to your skin’s cells. That blood supply allows for more oxygen and vital nutrients to travel to the skin cells, stimulating the creation of collagen and diminishing the appearance of aging. Every application of the Recover Masque will repeat this process, leading to improved blood flow over time, lessening the signs of aging over time. 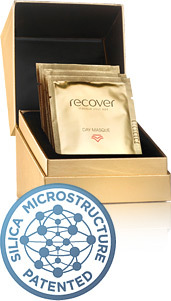 The silica microstructure net formed by the Recover Masque also acts as a “reservoir” for other serums and creams applied to the skin. The net manages the delivery of the serum and cream to wherever they’re needed, thereby maximizing the effectiveness of your other skincare products. Click here to shop Recover.